These were words of St. John Paul II that we would hear many times during his long and remarkable pontificate. But he spoke them for the first time as Pope 40 years ago today, October 22, 1978, to the crowds gather in St. Peter’s Square for his inaugural homily. He was elected on October 16, 1978, and served until his death on April 2, 2005. John Paul II was the second longest-serving pope in modern history after Pope Pius IX, who served for nearly 32 years from 1846 to 1878. 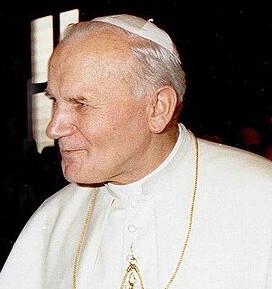 Born in Poland, John Paul II was the first non-Italian pope since the Dutch Pope Adrian VI, who served from 1522 to 1523. April 2, 2017, marked the 12th anniversary of Pope Saint John Paul II’s death, and Pope Francis paid homage to him today during his Wednesday audience when greeting the Polish pilgrims present in St. Peter’s Square. “Let us accept these Messages so that they fill our hearts” and “let us open the doors to Christ,” he said, recalling the Polish Pope’s words just after being elected. “These years have made us understand how John Paul II has entered people’s heart; he lives with us and his memory is always alive. The affection for him is demonstrated by the people that visit his tomb and invoke his intercession,” said Monsignor Slawomir Oder, Postulator of Pope John Paul II’s canonization, in an interview with SIR Agency on the eve of the 12th anniversary of his death, which occurred at 9:37 pm on April 2, 2005. What can John Paul II still say today, in Pope Francis’ Church? “The central message of the Church, which Pope Francis continues to interpret, in keeping with his own charism and enriching it with his experience, wisdom, and holiness,” answered Monsignor Oder. The cry we heard at the beginning of the Polish Pope’s pontificate — ‘Do Not Be Afraid, Open Wide the Doors to Christ’ –, we hear constantly today, in the Church led by Pope Francis, as an invitation to authenticity of life and of the Christian spirit, and to recognize Christ’s presence in the Church and in our brothers who live in difficulties,” he added. On a purely statistical basis, his papacy was astonishing. He was one of the most traveled world leaders in history, visiting 129 countries during his pontificate. He beatified 1,340 people and canonised 483 saints, more than the combined total of his predecessors during the preceding five centuries. By the time of his death, he had named most of the College of Cardinals, consecrated or co-consecrated a large number of the world’s bishops, and ordained many priests. Under his leadership, the Church reformed canon law and issued the Catechism of the Catholic Church; his own writing was voluminous. He helped to make the Church a significant player in international affairs, including the fall of Communism in Eastern Europe. “You are the Christ, the Son of the living God” (Mt 16:16). These words were spoken by Simon, son of Jonah, in the district of Caesarea Philippi. Yes, he spoke them with his own tongue, with a deeply lived and experienced conviction—but it is not in him that they find their source, their origin: “…because it was not flesh and blood that revealed this to you but my Father in heaven” (Mt 16:17). They were the words of Faith. These words mark the beginning of Peter’s mission in the history of salvation, in the history of the People of God. From that moment, from that confession of Faith, the sacred history of salvation and of the People of God was bound to take on a new dimension: to express itself in the historical dimension of the Church. Yes, Brothers and sons and daughters, these words first of all. Their content reveals to our eyes the mystery of the living God, the mystery to which the Son has brought us close. Nobody, in fact, has brought the living God as close to men and revealed him as he alone did. In our knowledge of God, in our journey towards God, we are totally linked to the power of these words: “He who sees me sees the Father.” He who is infinite, inscrutable, ineffable, has come close to us in Jesus Christ, the only-begotten Son of God, born of the Virgin Mary in the stable at Bethlehem. Today the new Bishop of Rome solemnly begins his ministry and the mission of Peter. In this city, in fact, Peter completed and fulfilled the mission entrusted to him by the Lord. The Lord addressed him with these words: “…when you were young you put on your own belt and walked where you liked; but when you grow old you will stretch out your hands and somebody else will put a belt round you and take you where you would rather not go” (Jn 21:18). What else but obedience to the inspiration received from the Lord guided him and brought him to this city, the heart of the Empire? Perhaps the fisherman of Galilee did not want to come here. Perhaps he would have preferred to stay there, on the shores of the Lake of Genesareth, with his boat and his nets. But guided by the Lord, obedient to his inspiration, he came here! According to an ancient tradition (given magnificent literary expression in a novel by Henryk Sienkiewicz), Peter wanted to leave Rome during Nero’s persecution. But the Lord intervened: he went to meet him. Peter spoke to him and asked. “Quo vadis, Domine? “—” Where are you going, Lord?” And the Lord answered him at once: “I am going to Rome to be crucified again.” Peter went back to Rome and stayed here until his crucifixion. Yes, Brothers and sons and daughters, Rome is the See of Peter. Down the centuries new Bishops continually succeeded him in this See. Today a new, Bishop comes to the Chair of` Peter in Rome, a Bishop full of trepidation, conscious of his unworthiness. And how could one not tremble before the greatness of this call and before the universal mission of this See of Rome! To the See of Peter in Rome there succeeds today a Bishop who is not a Roman. A Bishop who is a son of Poland. But from this moment he too becomes a Roman. Yes—a Roman. He is a Roman also because he is the son of a nation whose history, from its first dawning, and whose thousand-year-old traditions are marked by a living, strong, unbroken and deeply felt link with the See of Peter, a nation which has ever remained faithful to this See of Rome. Inscrutable is the design of Divine Providence! In past centuries, when the Successor of Peter took possession of his See, thetriregnumor tiara was placed on his head. The last Pope to be crowned was Paul VI in 1963, but after the solemn coronation ceremony he never used the tiara again and left his Successors free to decide in this regard. He who was born of the Virgin Mary, the carpenter’s Son (as he was thought to be), the Son of the living God (confessed by Peter), came to make us all “a kingdom of priests”. The Second Vatican Council has reminded us of the mystery of this power and of the fact that Christ’s mission as Priest, Prophet-Teacher and King continues in the Church. Everyone, the whole People of God, shares in this threefold mission. Perhaps in the past, the tiara, this triple crown, was placed on the Pope’s head in order to express by that symbol the Lord’s plan for his Church, namely that all the hierarchical order of Christ’s Church, all “sacred power” exercised in the Church, is nothing other than service, service with a single purpose: to ensure that the whole People of God shares in this threefold mission of Christ and always remains under the power of the Lord; a power that has its source not in the powers of this world but in the mystery of the Cross and Resurrection. The absolute and yet sweet and gentle power of the Lord responds to the whole depths of the human person, to his loftiest aspirations of intellect, will and heart. It does not speak the language of force but expresses itself in charity and truth. The new Successor of Peter in the See of Rome, today makes a fervent, humble and trusting prayer: Christ, make me become and remain the servant of your unique power, the servant of your sweet power, the servant of your power that knows no eventide. Make me be a servant. Indeed, the servant of your servants. Brothers and sisters, do not be afraid to welcome Christ and accept his power. Help the Pope and all those who wish to serve Christ and with Christ’s power to serve the human person and the whole of mankind. Do not be afraid. Open wide the doors for Christ. To his saving power open the boundaries of States, economic and political systems, the vast fields of culture, civilization and development. Do not be afraid. Christ knows “what is in man”. He alone knows it. Precisely today the whole Church is celebrating “World Mission Day”; that is, she is praying, meditating and acting in order that Christ’s words of life may reach all people and be received by them as a message of hope, salvation, and total liberation. I thank all of you here present who have wished to participate in this solemn inauguration of the ministry of the new Successor of Peter. I heartily thank the Heads of State, the Representatives of the Authorities, and the Government Delegations for so honouring me with their presence. Thank you, Eminent Cardinals of the Holy Roman Church. I thank you, my beloved Brothers in the Episcopate. To you, Sisters and Brothers, Religious of the Orders and Congregations, I give my thanks. Thank you, people of Rome. Thanks to the pilgrims who have come here from all over the world. Thanks to all of you who are linked with this Sacred Ceremony by radio and television. I speak to you, my dear fellow-countrymen, pilgrims from Poland, Brother Bishops with your magnificent Primate at your head, Priests, Sisters and Brothers of the Polish Religious Congregations—to you representatives of Poland from all over the world. What shall I say to you who have come from my Krakow, from the See of Saint Stanislaus of whom I was the unworthy successor for fourteen years? What shall I say? Everything that I could say would fade into insignificance compared with what my heart feels, and your hearts feel, at this moment. So let us leave aside words. Let there remain just great silence before God, the silence that becomes prayer. I ask you: be with me! At Jasna Gora and everywhere. Do not cease to be with the Pope who today prays with the words of the poet: “Mother of God, you who defend Bright Czestochowa and shine at Ostrabrama”. And these same words I address to you at this particular moment. That was an appeal and a call to prayer for the new Pope, an appeal expressed in the Polish language. I make the same appeal to all the sons and daughters of the Catholic Church. Remember me today and always in your prayers! To the Catholics of French-speaking lands, I express my complete affection and devotedness. I presume to count upon your unreserved filial assistance. May you advance in the faith! To those who do not share this faith, I also address my respectful and cordial greetings. I trust that their sentiments of goodwill may facilitate the spiritual mission that lies upon me, and which does not lack repercussions for the happiness and peace of the world. To all of you who speak English I offer in the name of Christ a cordial greeting. I count on the support of your prayers and your goodwill in carrying out my mission of service to the Church and mankind. May Christ give you his grace and his peace, overturning the barriers of division and making all things one in him. [The Holy Father spoke in similar terms in German, Spanish, Portuguese, Czechoslovakian, Russian, Ukranian and Lithuanian]. I open my heart to all my Brothers of the Christian Churches and Communities, and I greet in particular you who are here present, in anticipation of our coming personal meeting; but for the moment I express to you my sincere appreciation for your having wished to attend this solemn ceremony. — help me to be able to serve you! Amen.